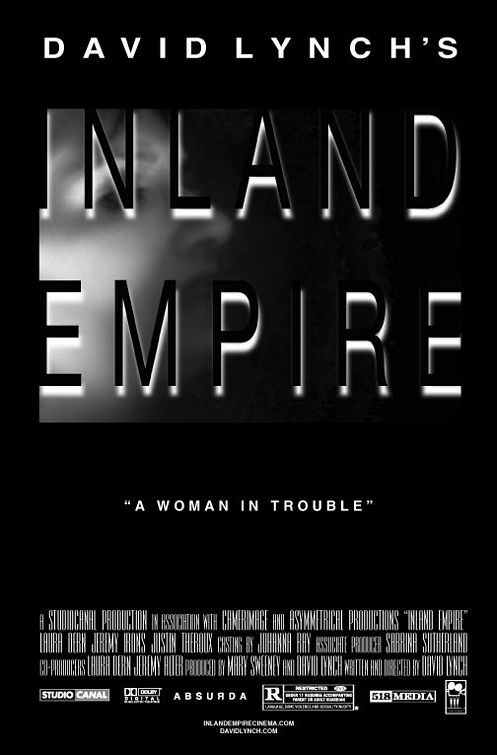 INLAND EMPIRE is to cult-hero director David Lynch what KILL BILL was to cult-hero director Quentin Tarentino. No expense or indulgence spared, no reins, no guardrails, and everything that makes this idiosyncratic filmmaker the...thing that he is, an unadulterated Lynch-a-thon. Never mind his "mainstream" success in Twin Peaks or even the bizarre trivia that George Lucas wanted Lynch for RETURN OF THE JEDI; this feature is the fellow back to his roots in grainy, grotesque and troubling avant-garde/experimental cinema, shooting in international locations without a completed script, having at his disposal a megabucks cast and winding up with a three-hour running time. It was also more or less self-distributed by Lynch city by city, during its non-studio 2006 release. In Cleveland INLAND EMPIRE was booked for an unprecedented seven-day run at the Cleveland Cinematheque. Director John Ewing told me at the time that fans were coming in from as far as Pittsburgh and Cincinnati just to see it. Infuriating, weird and entrancing in fits, INLAND EMPIRE has one foot in Lynch's previous MULHOLLAND DRIVE and the other foot (maybe two or three other feet) in ERASERHEAD and his breakthrough short THE GRANDMOTHER. The principle setting (maybe) is Hollywood, the "city of dreams" in Lynchspeak. The plot/plots come at you in disconnected fragments, flashbacks, flash-forwards, nightmares and hey! Fooled you! movies-within-movies. The most coherent stretch, poking up for just 45 minutes or so like a sandbar underneath roiling waters, concerns Nikki Grace (Laura Dern), an actress needing a comeback, who lands a lead role in a prestigious production "On High in Blue Tomorrows." She's cast opposite a bad-boy actor named Devon Berk (Justin Theroux), married with kids but infamous for on-set love affairs. And lurking (literally) in the shadows is Nikki's jealously possessive husband, a gangsterish Pole. During rehearsals Nikki and Devon hear the revelation that "On High in Blue Tomorrow" is actually a remake of a script whose previous production had to stop when the lead actors were killed - and that the storyline itself derives from an ominous Eastern European gypsy folklore. The metaphysical stage is set for some to go "bad wrong," as Dern later puts it, as the loose narrative sunders at the seams at the one-hour mark. We see interludes in Lodz, Poland, in the early 20th century (the first attempt to film the script? ), a woman telling a detective she's been hypnotized to plotting murder with a screwdriver, Hollywood Boulevard whores and street people, and weird omens and portents. Nikki transforms; she's no longer the classy, mansion-dwelling `Nikkie Grace' but the battered, wrong-side-of-the-tracks floozie `Susan Blue,' again unblissfully wed to the Polish guy and complaining to a detective about a sense that time is out of joint. It might be a clue that the director of Nikki and Devon's movie is played by Jeremy Irons, star of 1981's THE FRENCH LIEUTENANT'S WOMAN, in which a Victorian-era tale of adultery paralleled the same thing happening on a movie set rendering the tale - director Karel Reisz translating author John Fowles' famous literary conceit of telling you that it was merely a story, yet persisting with it anyway. Underneath all the creepy and oft-pretentious David Lynch Institute of Art film-school stuff, storytelling seems to at the heart of INLAND EMPIRE, where fictions and desire-fed dark imaginings appear to take on a sentience of their own, no less legitimate than the minds and hearts that created them ("Actions do have consequences," a witchy woman warns Nikki at the start), and cinema excels in magickally scrambling artifice and reality. Perhaps Lynch is wondering of the dreamtime where abide unrealized Projects - such as his own never-filmed "Rocket Ronnie" and "One Saliva Bubble." Perhaps Nikki is fallacious and Susan is the truth. Perhaps we're no more real than what's on the screen (in which case some actress is getting the Oscar for her portrayal of `Lindsay Lohan').